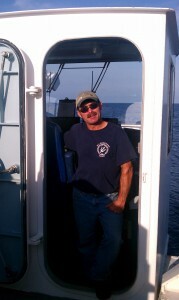 Oscar is an AB Seaman (Able Bodied) on board the R/V Endeavor. His duties as an AB on board the Endeavor include tieing up the ship, running winches, crane operations, painting and other maintenance duties (both interior and exterior), greasing machinery, small boat operations, bridge watches, hourly rounds, and keeping designated stations clean. Oscar is the newest arrival to the R/V Endeavor (R/V stands for Research Vessel), he is currently serving his third season. Before joining the Endeavor crew Oscar was a commercial fisherman out of Point Judith, RI. There he worked on a dragger (AKA trawler), which caught various species of fish. Oscar has worked on boats since he was a kid and never imagined doing anything other than working on boats. In his tender years he used to go scalloping with his father and grandfather and was hired as a mate on a charter boat as his first official job. When asked about any advice he would offer to people interested in working on the water, he said “GO for it! If you love the sea, water, and travelling, then go for it!” It’s not all fun and games though. Oscar talks about how being away from home is one of the toughest parts about this job. He is currently away from his friends and family for the fourth month. However the rewards outweigh the drawbacks and if travelling and being on the water is something you love, Oscar suggests you go for it!